DO-17090-30 was succesfully added to your cart. Calibrations on conductivity and resistivity meters are performed using multi-function calibrators, standards-grade reference multimeters, and precision resistors per manufacturer’s procedures. Measurements can be taken to 1100 Mega Ohms and 1000 milliSiemens. Meters without a detachable probe are tested with standard reference materials from an ISO Guide 34 accredited manufacturer. Measurements are performed per manufacturer’s procedures up to 12,880 microSiemens. 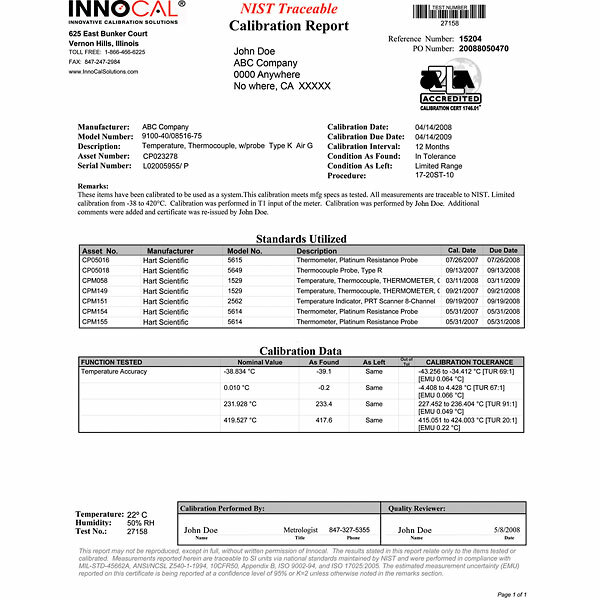 This calibration comes with data for conductivity, resistivity, and temperature. Is this calibration good for only one meter or can it be used for an order of 2 or more meters? The same calibration can be used for multiple meters, however, the fee specified is for each meter individually. Please contact our customer service department (the number can be found under the Contact Us section on our website) to obtain a Service Return authorization number. The item can then be sent back to our facility for calibration once you have obtained this number.